Transform the healthcare safety net, reduce avoidable hospital use, and improve outcomes. In April 2014, the Centers for Medicare and Medicaid Services approved New York State’s $8 billion Medicaid waiver request. The majority of the funding ($6.42 billion) will go toward the Delivery System Reform Incentive Payment (DSRIP) program, including DSRIP Planning Grants, DSRIP Provider Incentive Payments, and DSRIP Administrative costs. 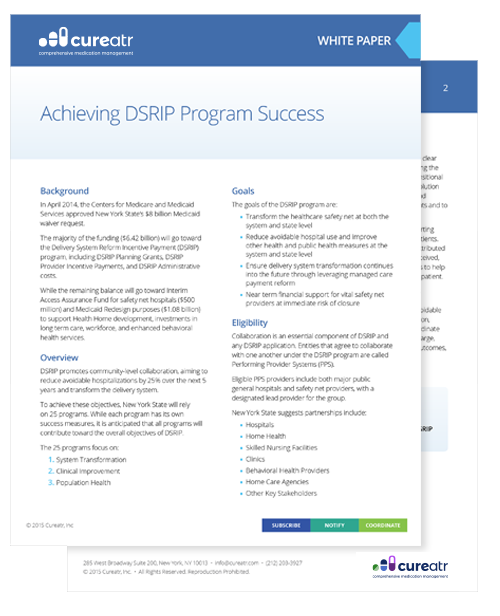 The purpose of the DSRIP is to promotes community-level collaboration, aiming to reduce avoidable hospitalizations by 25% over the next 5 years and transform the delivery system. 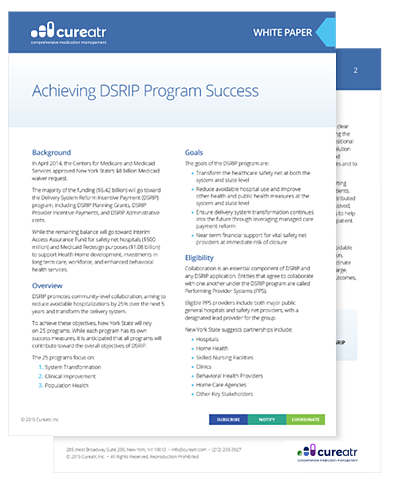 In this white paper, learn how to achieve success with the DSRIP program.